AI researcher jobs are commanding upwards of $1 million salaries. The rise of AI across all of tech created a shortage of qualified tech talent that led to the boost in salary potential for this role. People interested in cashing in on a career in AI still largely need a postgraduate education and experience with a top tech company. It’s no secret that many tech careers pay exceptionally well. From software engineers to data scientists, product managers to UX designers, the average salaries for most top tech jobs easily climb into the six figures. But a seven-figure salary? Now that’s something to talk about. Normally, conversations about million-dollar salaries center around athletes or actors. In the tech space, you could probably find a handful of C-level executives raking in $1 million plus. But, never before has there been a 1 million dollar salary for someone straight out of grad school. Until now, that is. Because according to some recent press coverage by The New York Times, there’s a new role in tech where for the right candidate, even a non-profit is willing to cough up over $1 million in compensation. AI researchers are some of the most in-demand talent in all of tech, and as a result, candidates with the skills and expertise to help develop and execute an AI strategy for tech companies are claiming some of the highest salaries ever seen in tech. Move over data scientist salaries…there’s a new top-paying job in town. What Does an AI Researcher Do? The role and responsibilities of an AI researcher are fairly loose. But, as a general definition, AI researchers are responsible for ensuring their company is up-to-date with the latest trends in machine learning and, ideally, at the cutting edge of innovation in the field as well. It’s a role with broad-stroke responsibilities. However, AI researchers generally focus on developing neural networks—the intensely complex algorithms behind everything from Siri to your Netflix recommendations. More and more companies are looking to integrate artificial intelligence into their products, and as a result, the demand for AI researchers has far exceeded the supply. Why Are AI Researchers So In-Demand? Working with artificial intelligence is obviously a relatively new and continuously developing field. For those with the foresight to dip their toes in the AI talent pool, the career opportunities have been nothing short of amazing. But, according to the article from the Times, current demand far outweighs supply—and things are only getting worse. There are an estimated 22,000 AI researchers on the market today—double that of a year prior—and a wide range of tech companies are fighting to scoop up those candidates directly out of school or poach them from competitors. The intense demand for AI talent created a bidding war that has seen AI data scientist salaries for top candidates climb well into the seven figures. That bidding war has drawn talent not only from competitors but also from the colleges and universities. As a result, at a time when companies need more AI talent, there are fewer educators in place to teach them. Furthermore, though the pool of available talent doubled between 2016 and 2017, the number of companies interested in AI researchers has also grown exponentially. One analyst cited in the Times piece believes the number of companies interested in hiring AI researchers is growing faster than the rate of new AI talent, further widening the supply and demand gap. So, Is Now a Good Time to Become an AI Researcher? Ummm, yes. As we highlighted in our recent roadmap to becoming an AI engineer, getting involved in AI isn’t necessarily easy—but the payoffs can be huge. According to recent Paysa data, two-thirds of AI engineers have post-graduate educations. 20 percent have their Ph.D. So clearly, a post-graduate education is a prerequisite to working in AI at most tech companies. But, a good education doesn’t guarantee you a seven-figure salary. 1 million dollar earners are experts in their fields and typically come from top companies like Google and Facebook. 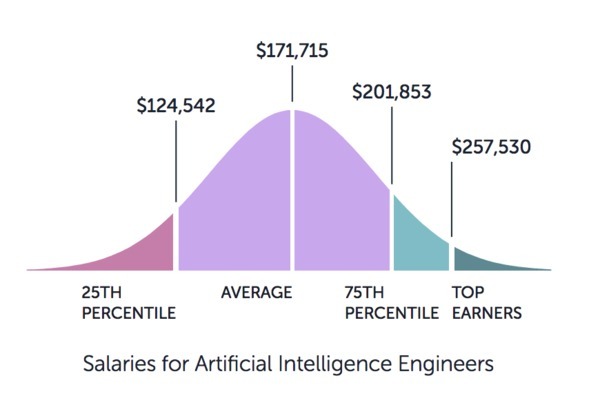 In fact, according to Paysa, the average salary for AI engineers—a related job title—is just over $171,000 per year with top earners in the $257,000 per year range. Now, of course, a $171,000 per year salary isn’t anything to scoff at. But, it does mean making top-dollar isn’t a surefire thing. You will likely need to work your way into a position with that kind of earning potential. The good news is, though, that it’s possible. Software engineers, data scientists, product managers…they all dream of the 1 million dollar salary. But, for some AI researchers, it’s a reality. Google is one of the companies competing heavily for top AI talent. Want to learn more about Google’s AI-first approach to business? Check out this recent post from the Paysa blog.